If your kids ask your for a tablet this holiday season, don’t get them a Nexus 7 or Surface because they might slap you with it. 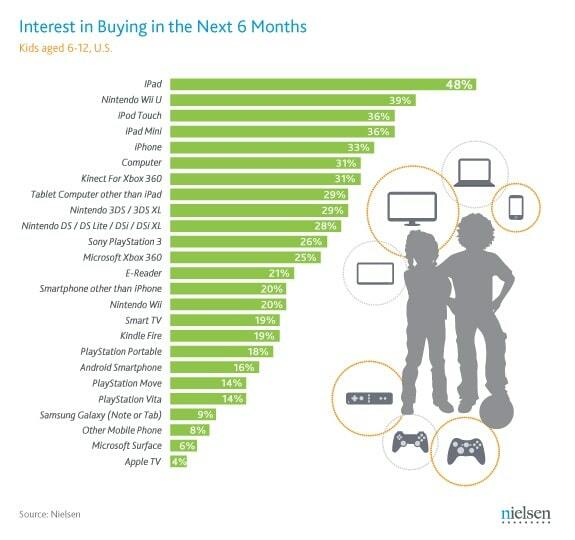 According to new study from Nielsen, American kids between age 6-12 aren’t asking for handheld gaming devices anymore – they now want iPads from Apple. The study reveals that 48% of kids want an iPad for Christmas, while Nintendo Wii U is the second most desired electronic device with 39%. Microsoft Surface is at the bottom with 6% competing with Apple TV at 4%. Then, after the Wii U, Apple’s devices continue to be the most desired devices in the list with iPod touch, iPad mini, and iPhone.